The SG-1000 (エスジー・セン, Esujī Sen? ), which stands for Sega Game 1000, is a cartridge-based video game console manufactured by Sega. This system marked Sega's first entry into the home video game hardware business, and while the system was not popular, it provided the basis for the more successful Sega Master System. The SG-1000 was first released to the Japanese market on July 15, 1983. The console reached minor success in that market and sold moderately well within Asia until 1985. The system was launched in New Zealand as released by Grandstand Leisure Limited, Australia and in other countries, such as Italy, Spain, and South Africa. The console in its original form was never launched in North America. Othello Multivision console and controller. Game manufacturer Tsukada Original produced the Othello Multivision (オセロマルチビジョン, Othello Multivision? 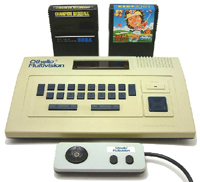 ), an SG-1000 clone, in the same year the Sega console was released. Pages in category "Sega SG-1000"
This page was last edited on 26 April 2015, at 02:05.